I made my Tomato & Cumin Tofu Scramble twice in one day as requested by my sister. 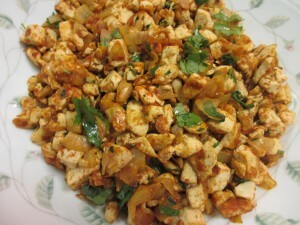 It’s very easy to prepare, simply flavored with tomato sauce, ground cumin, and fresh cilantro. You might want to keep tomato sauce handy for this and other recipes, frozen in an ice cube tray. Serve with rice or potatoes and top with optional avocado, queso fresco, sour cream, etc.! Heat oil in a large non-stick frying pan over medium heat. Add onion and garlic. Cook for 5 minutes, stirring occasionally. Add tofu, tomato sauce, cumin, and salt to pan and increase heat to medium-high. With a heat-proof spatula break up the tofu, stirring occasionally, and cook for about 20 minutes or until the tomato sauce coating the tofu and onions begins to caramelize. Adjust salt and cumin to taste. Mix in cilantro.